Even though I’d heard great things about sewing with neoprene, I wasn’t really tempted to try out the new-to-me fabric. I was worried that it would be too hot to wear or that it would make people wonder why I was wearing a wetsuit to the park. But then Mood Fabrics started offering digitally printed neoprene jerseys, and those prints were just too much to resist. There were quite a few prints that I considered, but this Mulberry Roses digital print ending up being the winner. When the fabric arrived, I was pleasantly surprised by how well it draped when I hung it on my dress form. It was not at all stiff like my surfing wetsuit. It still felt sporty to me, but it didn’t scream I’m-supposed-to-be-a-wetsuit like I feared. While it was still on my dress form, I pinned it this way and that way to see how it behaved since I didn’t have a definite pattern in mind for it. I’d been thinking of making a sleeveless sheath dress, but the drape suggested I might have more options. My favorite ready-to-wear sporty dress is fitted through the top and then flares out into an A-line skirt. The jersey it’s made out of is definitely more fluid than this mulberry neoprene, but I still wondered if the neoprene could work in a similar silhouette. If I could pull it off, I knew I’d get a lot more wear out of a dress with an A-line skirt than a sheath since the former feels more everyday casual to me. 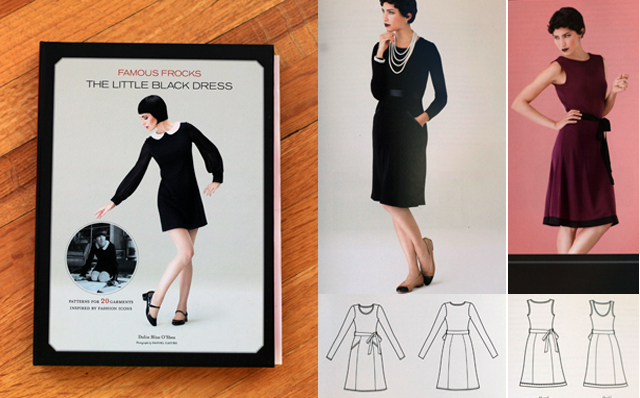 When I was looking through my pattern collection for potential patterns, I didn’t see much that tempted me until I got to my Famous Frocks: The Little Black Dress book. The Chanel Dress variation (far right, below) was pretty close to what I was imagining: a simple, fitted top with an A-line skirt. Ever since I first read through this book, I’ve always wanted to make one of its dresses. Most of the looks feel pretty classic to me. 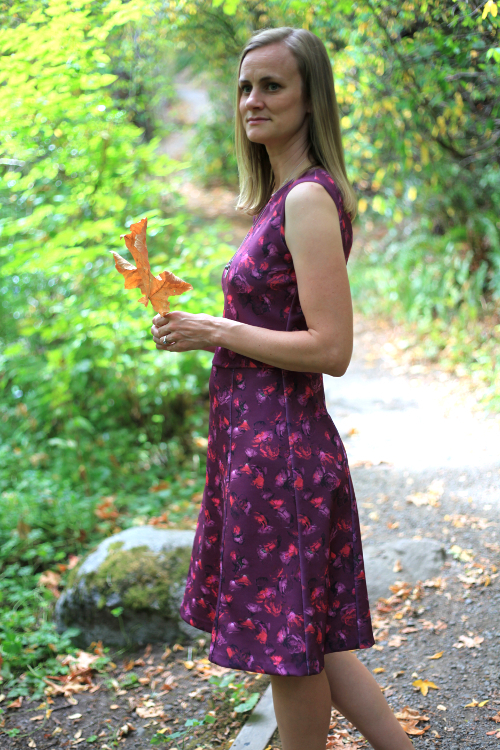 I thought I was going to make the wrap dress pattern… until my friend lent me her original Diane von Furstenburg wrap dress pattern. How could I pass that opportunity up? I was happy that this neoprene gave me another reason to try out the book. The patterns in this book are drafted for someone who is 5’3″ to 5’6″ tall and has a C cup. I’m 5’7″ and have a B cup so I started by adjusting the flat pattern to make what I figured were the necessary modifications: small-bust adjustment, extra length, extra at the side seams since my waist measurement fell into a different size than my bust measurement. I also made the necessary modifications for the variation: raise the front neckline, lower the back neckline, take off a bit from the armhole. Then I daringly cut straight into my neoprene. I figured the weight and stretch of the neoprene would be hard to mimic in in any cheap jersey I could spare, so I might as well just give the mulberry neoprene a go and hope for the best. Sewing the neoprene was easy. The only issues I had were prewashing and what to do with the skirt seams. My go-to fabric guide, Sandra Betzina’s More Fabric Savvy, said wetsuit fabrics like this one didn’t need to be pre-washed, but I wanted to anyway. 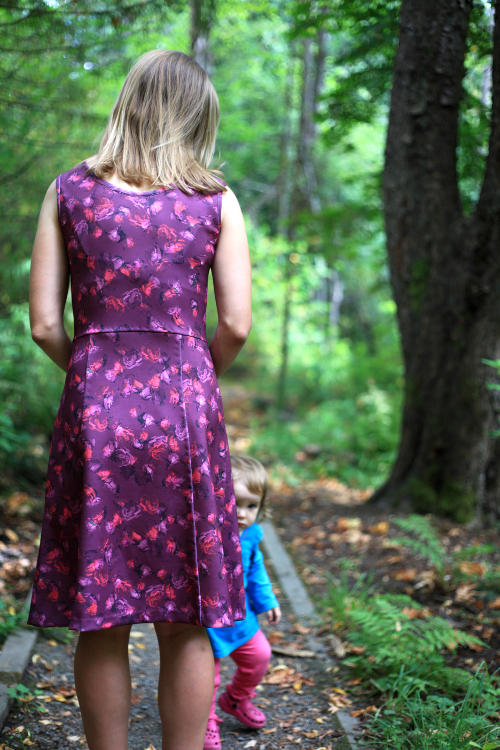 I threw it in with a thin white jersey that I was considering using as a lining when I wasn’t sure what pattern I was going to use (the Marcy Tilton shingle dress that I previously made here was a contender, and it uses a lining to hold the shingles in place). And, would you believe it – I had my first piece of white fabric turn pink! I’d heard stories of white socks becoming pink socks, but it’d never happened to me before. Ha! I learned a valuable lesson that everyone else already knows and that I’m surprised took me this long: be wary of washing colorful new fabrics with white fabrics! As for the skirt seams, they almost made me wish the pattern I’d chosen had fewer skirt seams. Or that I’d stuck with my original sheath plan. 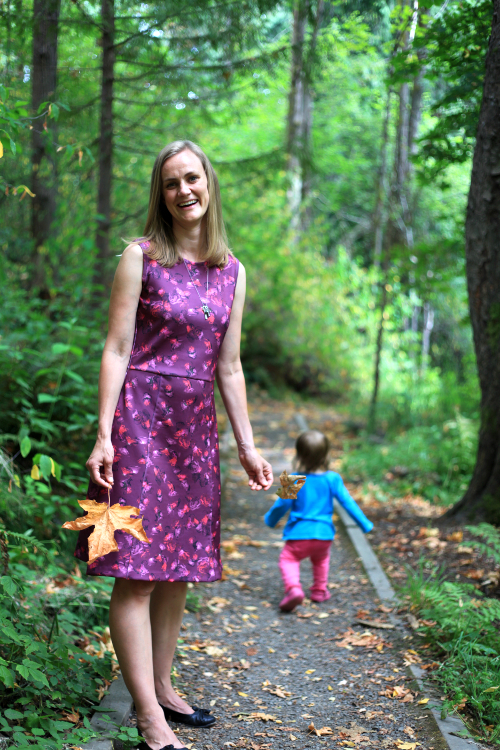 When simply sewn and pressed, they wanted to cave in on themselves at the hem. More Fabric Savvy recommended flat-locking the seams with my serger, but I thought that would be a little too sporty for this dress. I liked the idea though since I found that forcing the seam allowances to be flat really helped the skirt keep its A-line shape. I tried topstitching the seams to one side, in a mock-felled seam sort of way, but my topstitching pulled the neoprene too taut, showing off the unseemly white underbelly of the printed fabric (hello shine!). I carefully unpicked all of the topstitching and then catch stitched the seam allowances to one side to try to achieve a similar, but invisible, mock-felled effect. Though it’s not as noticeable in person, I didn’t quite achieve the completely invisible look I wanted. You can see little dimples along most of my seams in these photos. Because the neoprene fabric has a bit of thickness, I made sure to only catch the innermost layers when I was hand catch stitching, which leads me to believe that, just like with my wrap dress, the reason for the dimpling is that I pulled my catch stitches to tight – the second lesson in the making of this dress that I should have already learned. Urg. I might redo them if they still bother me after a few wears. The last major step was sewing the side seams. I started by basting them together in order to check the overall fit of the dress. Maybe it was the extra weight of the skirt or the stretch of the neoprene fabric, but the poor dress just hung off me! I pulled out the basting stitches and took the side seams in as much as I dared, essentially removing everything I’d added when I graded the flat pattern out to match the size for my true waist measurement. I thought the adjusted dress fit well when I checked it out in the mirror, but after looking at these photos, I can see that there are drag lines coming down from my bust. Maybe the weight of the skirt causes this neoprene to grow over time? Given that jerseys are so forgiving, I think I can reduce those drag lines by taking in the waist a bit more. But, I have to be careful since I don’t want to take in the dress too much since I already learned that this printed neoprene sort of shines when pulled too taut. The neckline and armholes are bound with self fabric and the hem line was turned up and catch stitched in place. I like the proportions of the skirt relative to the top, but maybe it hits me at a weird spot in my knee? 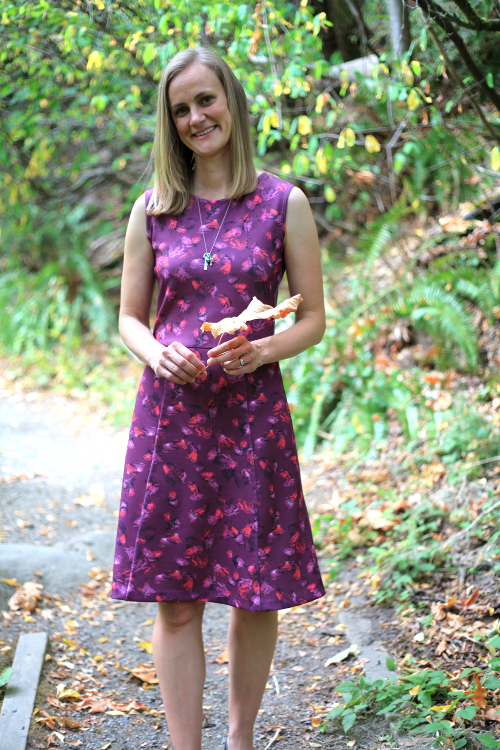 It’s funny – I felt great when I wore this dress out this weekend, but writing this post has shown me that the perfectionist in me does have a few issues with it. Maybe I asked the neoprene to do too much? Maybe it’s just natural to be critical for the blog? I actually really did enjoy wearing this dress this past weekend! But, if these little things do end up bothering me, then, thankfully, taking in the side seams, redoing the catch stitching, and altering the hem are all easy enough to do. 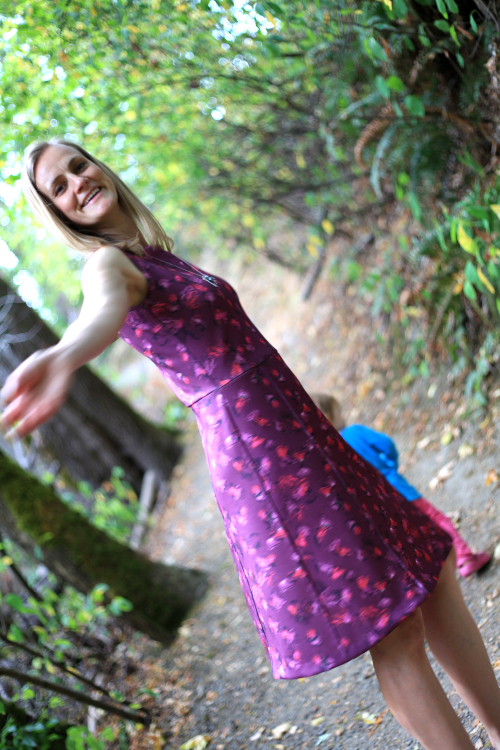 For now I’m just going to ignore them though and keep throwing this dress on as often as I can during this unseasonably warm Seattle summer! Have you ever sewn with neoprene? If so, what did you think? If not, would you ever?! Neoprene Jersey and Mesh Sheath Dress! Red Cotton Twill Trench Dress!